So this beauty of a fireplace was original to our house. 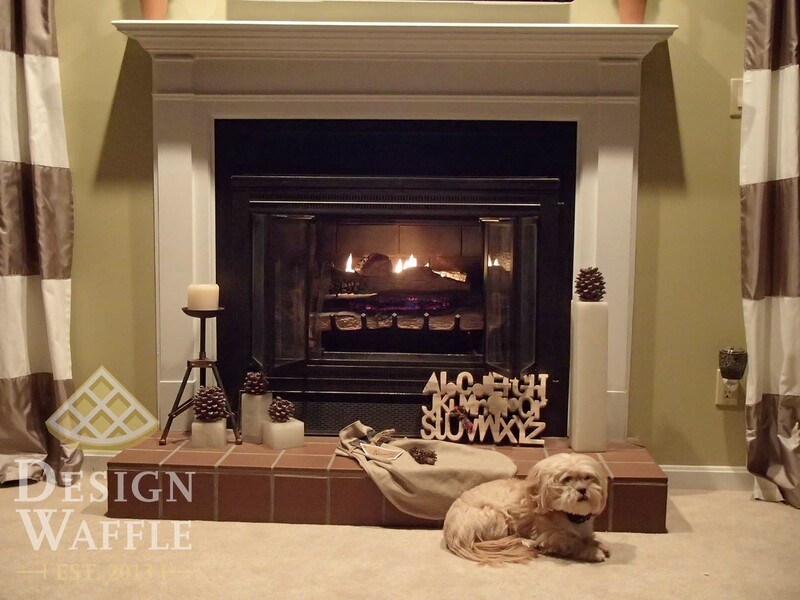 I was so happy to see that we had a fireplace, but other than it’s existence… I hated it. 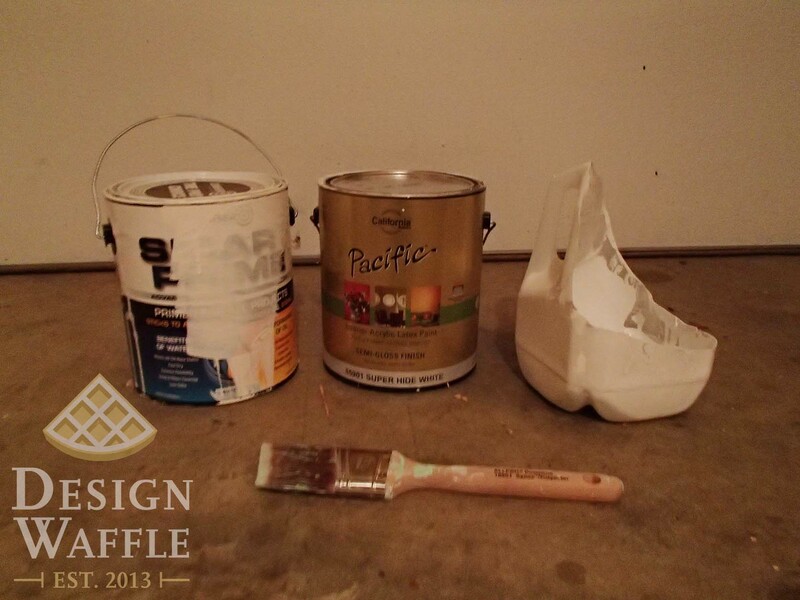 The stained wood, the brass and that awful tile that closely resembles the tile in a Subway or McDonald’s bathroom. 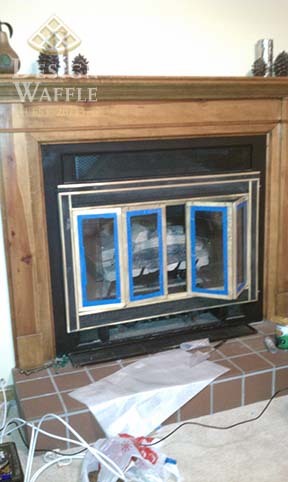 I thought about replacing the brass fireplace insert until my Dad told me we could paint it. The thought never came to my mind but once it was in my head, that was it. The fireplace as you see it here didn’t last more than a week of us living in the house. 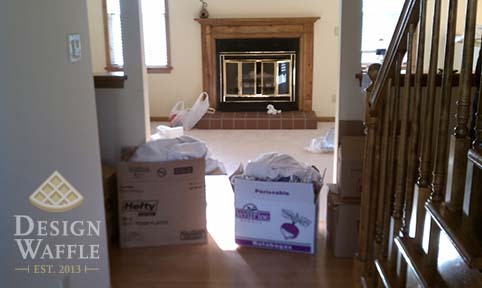 We didn’t even completely unpack our boxes. This was the very first diy project we did in our new home. 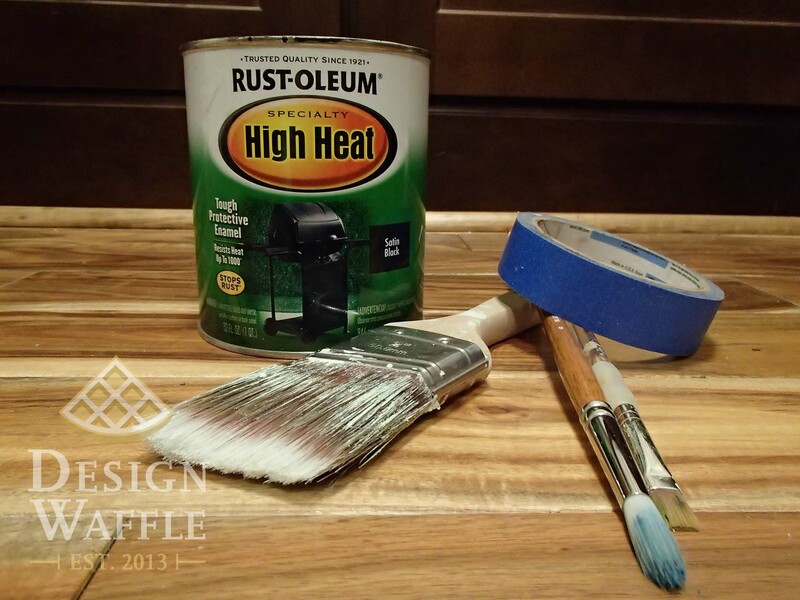 First, I gathered our supplies for painting the brass insert. 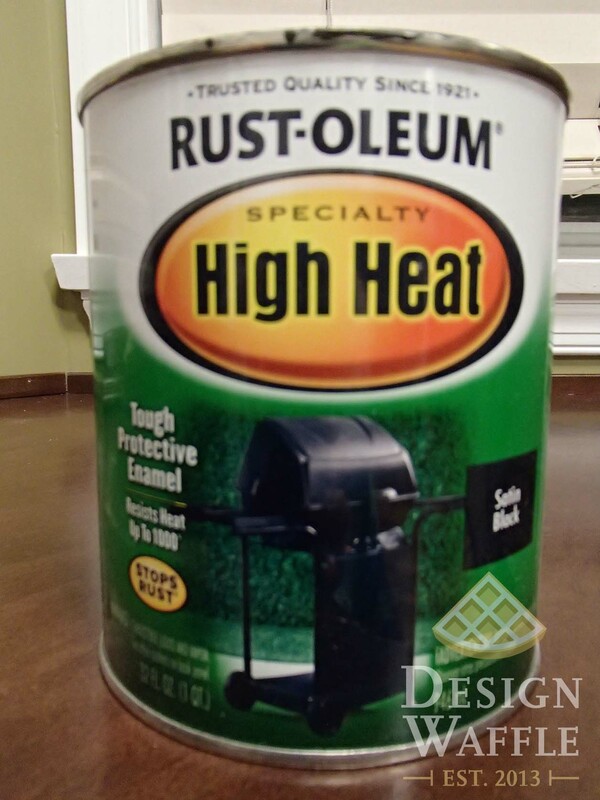 We bought High Heat Rust-oleum black paint from Lowes and used paint brushes we had lying around the house. Make sure to get painters tape too in order to tape off the glass. 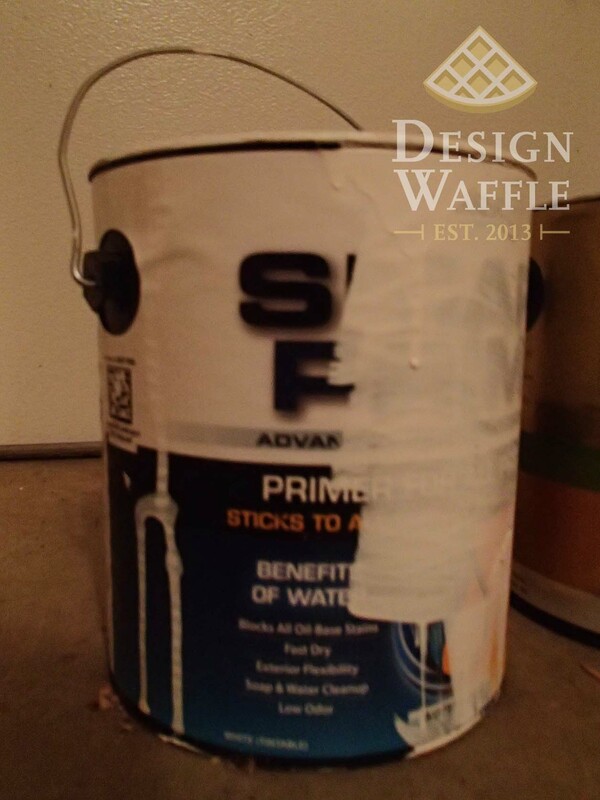 I loath blue painter’s tape and usually skip it altogether, but I actually used it for this project. I taped this baby up really good, making sure to shimmy the tape underneath the metal frame a little bit to catch any paint that might drip into the space between the frame and glass. I also lightly sanded all of the brass to help the paint stick a little better. 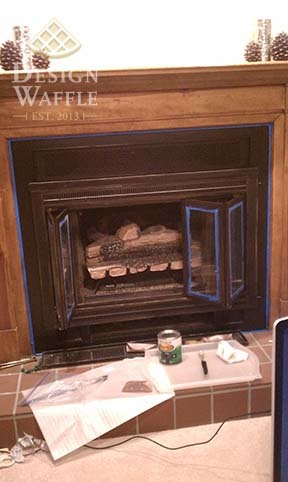 I ended up painting every part of the fireplace that was already black as well so it would have a uniform sheen so I taped off the wood trim too. It didn’t take long to cover up that nasty brass, but it did take a few coats. After the insert was painted, I was ready for the trim. I know some people like stained trim, but I’m not a fan and especially not in our house. White trim opens up a room and makes it feel so much bigger. Our house is “cute” and in other words, on the small side so we needed to make it feel as big as possible. Using a milk jug to hold paint is the absolute best way to get the job done. It’s free (yay! ), has a handle, and you can toss it when you’re done. Sometimes I’ll leave the spout (spout? I don’t even know what you call the part with the cap) on, which makes a nice little holder for your paintbrush. 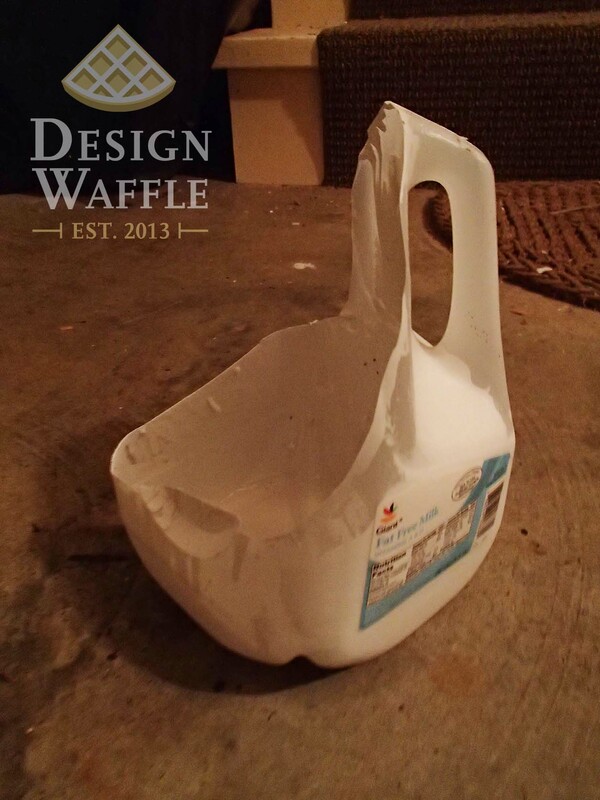 If you don’t already use a milk jug for painting trim and cutting in, you should! 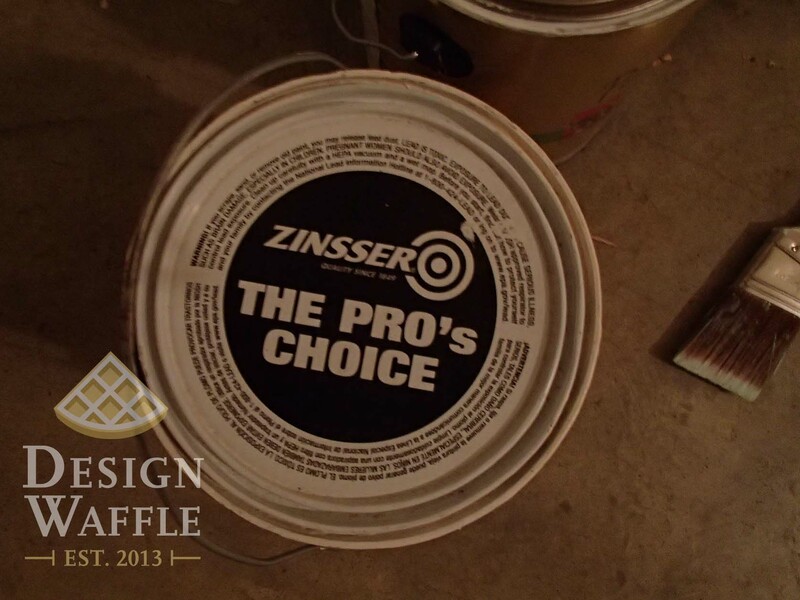 We bought Zinser primer (from a local paint shop) which worked really well and was enough to paint nearly all of the trim in our downstairs. It really stretches and lasts (sorry we’re such slobs and covered the can in dripage). 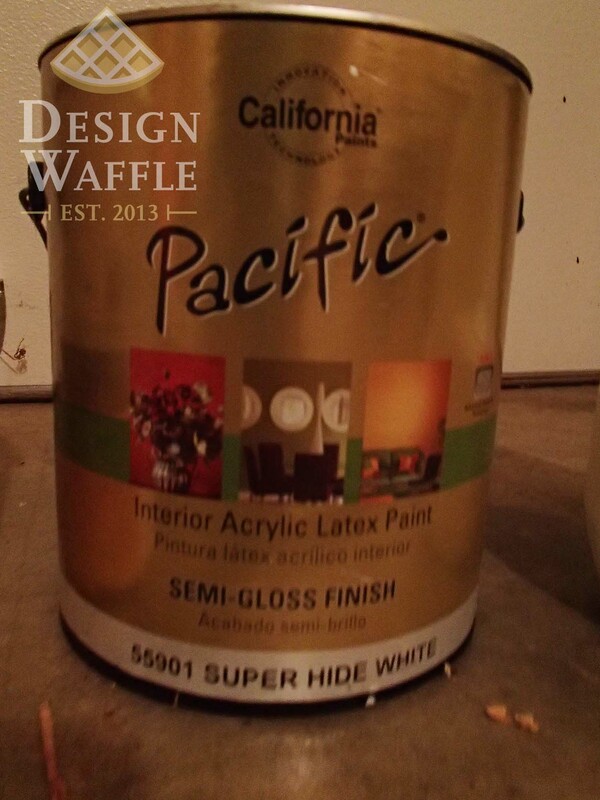 I did one coat of primer (as suggested by our local paint shop) and then 2-3ish coats of white paint. Here’s what one coat of primer and one coat of paint looks like. Much better already! And just to set the record straight, that’s our 2011 Christmas tree. We moved in a week before Christmas but I just had to have a tree. I tried my best to paint around the tree which involved me climbing under it, shimmying around it, reaching over it while on a ladder and so on until Travis made us take it down… sigh. I suppose it was a little ridiculous and time consuming to work around it. Somewhere along the way, we painted the walls green, which I had to fight Travis for but it was totally worth it. That creamy yellow had to go. 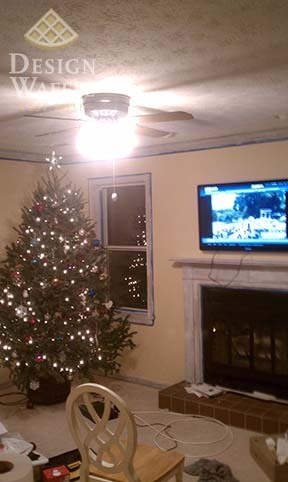 So now the tree is gone and we were ready to rehang our tv. 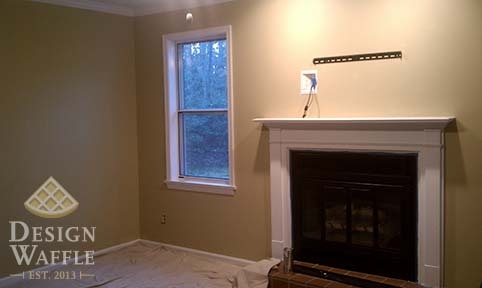 As you can see, we installed a recessed electrical box with an outlet so all of the cords would be hidden. Then my dad and bro-in-law helped Travis wire all of our cords down the inside of the wall, across the crawlspace, and into the hallway closet. My dad installed an outlet and power surge protector inside the closet. Our tv has an infrared signal built in so that you can still point the remote towards the tv, yet you don’t see any of the clutter. 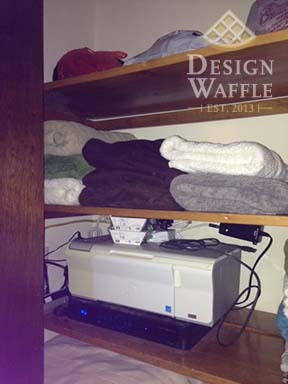 Yep, we even keep our printer in the closet. It’s hooked up too. This closet is very multifunctional. Yep, that’s the DIY network on tv, which was a total coincidence. But if it weren’t this channel, it would have been HGTV. So yes, that awful McDonald’s bathroom looking tile is still there but that’s another project another day. So far, I love how it turned out. I think Chloe appreciates all of our hard work too. 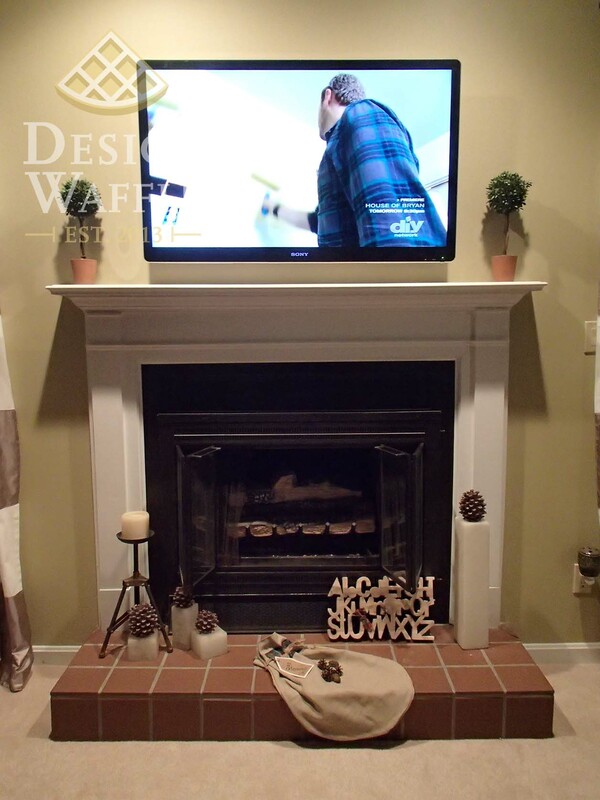 UPDATE: Check out how we tackled that ugly hearth in Part 2 of the fireplace makeover! 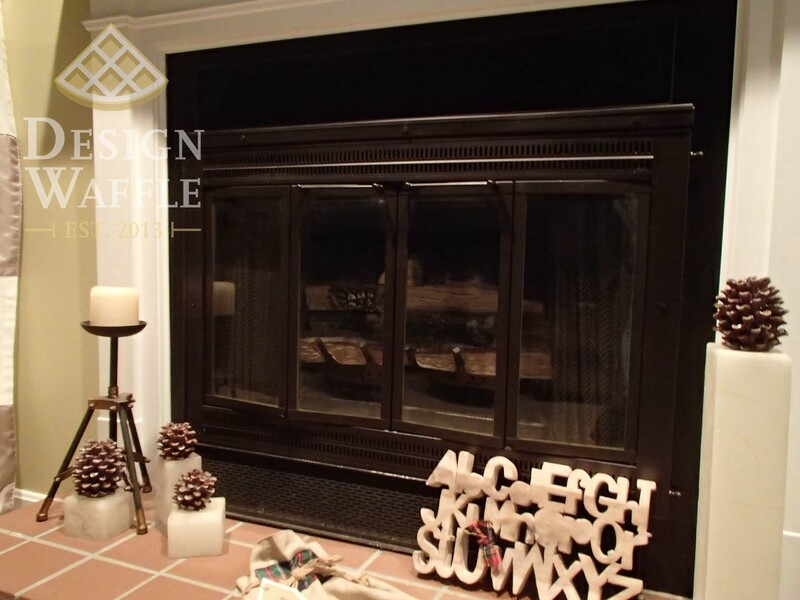 This entry was posted in DIY Projects and tagged Design Waffle, DIY, fireplace makeover, fireplace paint, white trim. Bookmark the permalink.